When exoplanet scientists first spotted patterns in disks of dust and gas around young stars, they thought newly formed planets might be the cause. But a recent NASA study cautions that there may be another explanation—one that doesn't involve planets at all. Exoplanet hunters watch stars for a few telltale signs that there might be planets in orbit, like changes in the color and brightness of the starlight. 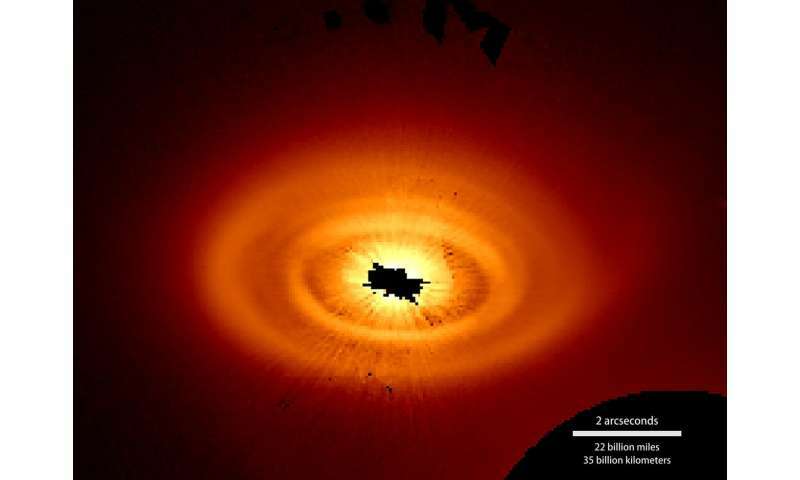 For young stars, which are often surrounded by disks of dust and gas, scientists look for patterns in the debris—such as rings, arcs and spirals—that might be caused by an orbiting world. "We're exploring what we think is the leading alternative contender to the planet hypothesis, which is that the dust and gas in the disk form the patterns when they get hit by ultraviolet light," said Marc Kuchner, an astrophysicist at NASA's Goddard Space Flight Center in Greenbelt, Maryland. Kuchner and his colleagues designed computer simulations to better understand these effects. The research was led by Alexander Richert, a doctoral student at Penn State in University Park, Pennsylvania, and includes Wladimir Lyra, a professor of astronomy at California State University, Northridge and research associate at NASA's Jet Propulstion Laboratory in Pasadena, California. The simulations were run on the Discover supercomputing cluster at the NASA Center for Climate Simulation at Goddard. "People very often model these systems with planets, but if you want to know what a disk with a planet looks like, you first have to know what a disk looks like without a planet," Richert said. Richert is lead author on the new study, which builds on Lyra and Kuchner's previous simulations by including an additional new factor: radiation pressure, a force caused by starlight striking dust grains. "Carl Sagan used to say extraordinary claims require extraordinary evidence," Lyra said. "I feel we are sometimes too quick to jump to the idea that the structures we see are caused by planets. That is what I consider an extraordinary claim. We need to rule out everything else before we claim that." The bad news is that they have found a new way gas can clump and imitate planets. The good news is that they have found a new way gas can clump and start form planets.